Scavenge is a family fun press your luck game. The game begins with three trash cans in the center of the table (decks of cards). One trash can is in the backyard, another on the porch and last on the driveway. On your turn you have two choices; one is to scavenge a trash can until you bust or decide you have had enough food and treasures or two, stash some of your goodies. 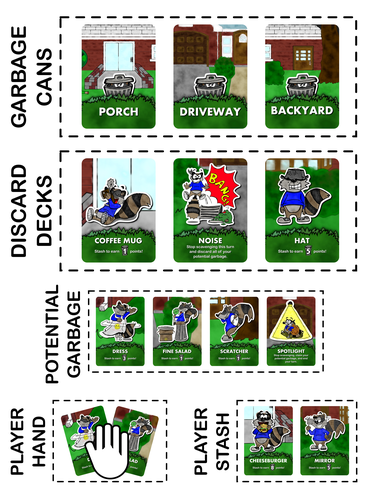 If you choose to scavenge, you must choose one trash can and turn over cards until you choose to stop or are forced to stop by a drawn card. Trash can cards are filled with both treasures and bad luck. Some treasures you might find are, yummy foods like salads or cheeseburgers while others have beautiful accessories such as a hat or comb. Each of these cards are worth points if you are able to stash them from your hand onto the table. The bad luck can come in the form for noise, dogs or marching ants. These cards all effect the deck in a various way such as discard cards, or discard potential garbage. After you have acquired some trash into your hand, you can choose to stash on a subsequent turn. Play continues until a player cannot draw because there are no cards left or all three cheeseburger point cards have been stashed. Our family couldn't love this game more! We love playing press your luck games. There isn't a lot of thinking and strategy involved and there are always surprises that induce crazy amounts of laughter. One of our favorite things about this game, is that it's easy to travel with. We have played games while waiting for a meal, at our favorite coffee shop and out on the patio. The rules are quick to read and easy to understand. It's a game that all ages can enjoy. While there is a bit of reading involved on the cards, they could easily be read by someone else after they are played. Really, number recognition is the most important component so even the little ones can play. We didn't really find a negative while playing. If I was really stretching, I might say the artwork could be a bit better but honestly the little guys are pretty cute. Nonstop Tabletop gives this game two thumbs up! our family struggled to find one!